In September, at a border checkpoint in the Canadian city of Cornwall, 67-year-old Antoine Delormier, an elder of the Mohawk Tribe of Akwesasne, was on his way to the community hospital to seek medical care for shortness of breath when he pulled his truck up to the Cornwall port-of-entry. He was told to exit the vehicle so it could be checked. According to reports in the Cornwall Standard-Freeholder, the area’s daily newspaper and one of the oldest newspapers in Canada, witnesses reported that after Delormier refused to exit due to his condition, he was pulled out, placed in a submission hold on the pavement, and later transported by ambulance to the hospital. He was released a week later, and attended a rally to mobilize for a better port-of-entry system for Akwesasne residents. Within a few weeks, he was back in the hospital, where he died a few weeks ago. The Cornwall Standard-Freeholder has also reported an incident involving Sarahlee Skidders, an Akwesasne resident who uses a wheelchair and was detained for five hours in Dec. 2011 at the Cornwall port-of-entry. She was threatened with criminal charges if she did not assist in the surrender of a man said to be her boyfriend, according to the story. Skitters’ suit against the against the CBSA for $600,000 is still pending and includes a count for violating an unusual provision in a 1794 treaty between Great Britain and the United States. “Under the treaty and corresponding legislation, Native Indians born in Canada are entitled to freely enter the United States for the purpose of employment, study, retirement, investing, and/or immigration,” according to the U.S. Embassy and Consulates in Canada. Crossing the U.S. Canada border is complex and arduous for the Akwesasne Tribe because of a geographical anomaly that affects only them. The Akwesasne – a word meaning “land where the partridge drums” – are a Mohawk tribe whose sovereign territory rests at the meeting place of three different nations – Canada, the United States, and the Mohawk. Most people who travel in the area have to cross at least one national border. For many Akwesasne residents, border crossings are a part of daily life, but they aren’t always simple. 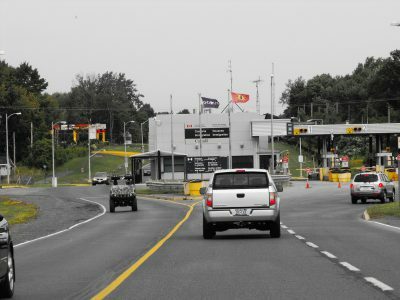 The current Canadian border checkpoint is in the city of Cornwall, so many of the people traveling to Cornwall Island, which is part of the Akwesasne Mohawk reserve, are residents from St Regis, the New York part of the reservation who must cross the St. Lawrence River into Ontario first. Most residents who cross the border are traveling to their jobs, schools, or shopping areas. This means they have to pass through the island and across the river. Once they make it through the checkpoint in Cornwall, people then must turn around and drive south to return to Cornwall Island. The entire ordeal can take up to two hours with heavy traffic, though the wait time is said to have improved. Mohawk Council of Akwesasne Grand Chief Abram Benedict presenting CBSA’s Alternative Reporting Proposal. Nov. 28, 2017. Click on the photo to see and hear the presentation. Grand Chief Abram Benedict stood in front of a powerpoint report and a map of the Akwesasne Territory and Surrounding Area to discuss a proposal for an alternative border crossing to the one that has been in place in Cornwall north of New York State and across the St. Lawrence River into Canada. 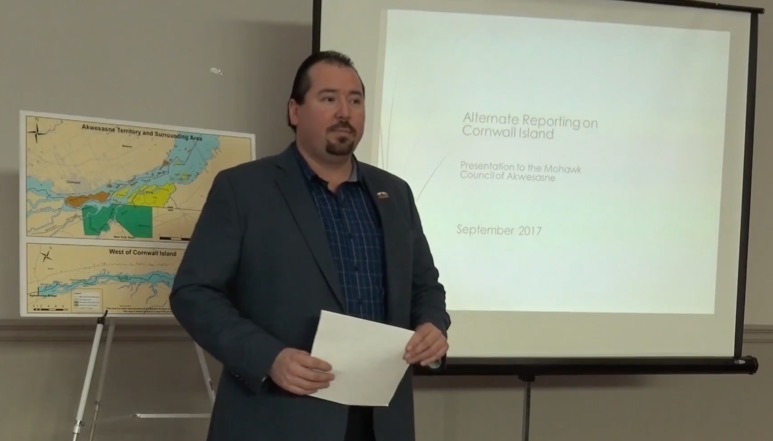 The Nov. 28 meeting had been called by the Mohawk Council of Akwesasne to respond to a proposal by the Canada Border Services Agency (CBSA) that might alleviate the traffic backlog that carries more passenger vehicles from the U.S. into Canada than any other crossing in New York. “It is not a solution to all of the challenges which we have; it is a mitigation measure to be able to have less cars waiting in line, less people heading into the city of Cornwall, doing a loop-around, and coming back,” said Grand Chief Benedict to those attending the presentation. The CBSA proposal for an alternative reporting checkpoint is to be used first by the locals who cross the Canadian border most frequently. The goal is for all Akwesasne residents to be able to use the checkpoint when entering the island and not have to cross into the city of Cornwall whatsoever. been consulted about the decision to arm Canadian border agents and they saw it as a threat to community safety. A protest of 50 Mohawks of all ages at the checkpoint was enough to cause the agents to abandon the station entirely. Now that checkpoint sits vacant. In the aftermath, Canada opened an inspection station on the north end of the bridge from the island into Cornwall. The CBSA’s proposed alternative reporting station has already attracted opposition. Jean-Pierre Fortin, National President of the Customs and Immigration Union (CIU), which represents Canadian border service officers has said that the proposed alternative reporting station would be understaffed by border patrol agents, as it would be controlled remotely from Ontario, and that CBSA officers would not be able to enter Cornwall Island with guns. As reported by North Country Public Radio and mentioned by Fortin himself, there already exist unstaffed, remote stations of entry for both land vehicles in the U.S. and boaters on the St. Lawrence River. Akwesasne’s history is fraught with the conflict of three nations – Britain, France, and the Mohawk- battling for control of the area, including in the Seven Years’ War and the Revolutionary War. 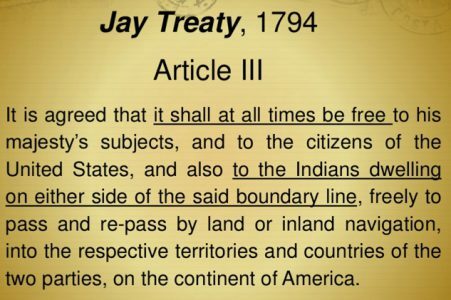 In 1794, the United States and Britain signed the Jay Treaty which in part proclaimed the right of indigenous people to travel freely across the border. “Under the treaty and corresponding legislation, Native Indians born in Canada are entitled to freely enter the United States for the purpose of employment, study, retirement, investing, and/or immigration,” according to the U.S. Embassy and Consulates in Canada. Click on photo to view the presentation by Angelina Amaral. That has been more aspirational than real. In 2015, two Akwesasne women tried to assert an “aboriginal right to mobility to travel freely” within the territory and claimed that having to check in at the Cornwall port-of-entry violated their Charter rights. The National Post reported that a Canadian judge ruled that issues of national security superseded any perceived right to a historical aboriginal right to freely travel within the Akwesasne territory. The judge added that any travel hardships were “self-imposed” by the Akwesasne people when they opposed the arming of CBSA officers at the port-of-entry when it was located on Cornwall Island. With stories of mistreatment by CBSA officers circulating in and around Akwesasne, it is no wonder that tensions are high, and the need to reduce travel time for Akwesasne residents high on the agenda.